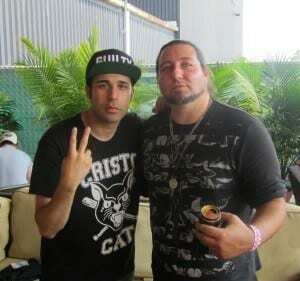 I got to sit down backstage at the Mayhem Festival with the, as he put it, “clean singer” of the band Islander, Mikey Carvajal. Islander are the new kids on the Metal scene, but they are blessed with a veteran musicianship and stage presence. Some journalists have been comparing the band to P.O.D., Bad Brains and the Nu Metal scene, but if Islander plays their metaphoric cards right, make just the right bluff at just the right time they could take the whole poker tournament. It is not surprising that the band attracts fans the second they hit the stage. I talked to a few people in the crowd about the Islander set and just about everybody said that they were an awesome show. So, I took the opportunity to really get down to who and what it is that might make this band so attractive to fans. I also really wanted all of you to know who Mikey is, being that they are so new to the scene. Kidman J. Williams: I’m not going to lie to you; you kind of fell into my lap at the last minute. Mikey Carvajal: What do you mean? KW: They gave me the interview at the last minute, so I don’t know a whole lot about you. KW: (laughs) This is true! MC: You can ask me anything, it doesn’t even have to be about music. I’m a wrestling fan! KW: Well there we go! We can start there. Who’s your favorite wrestler? KW: How excited are you to see Sting in the new WWE game? KW: (laughs) Are you guys in a van or a bus? MC: We are in a van right now. MC: Its going well, it is a little tight quarters sometimes. We make due and we’re thankful for what we have. We have my wife out with us right now and she is running our merchandise. So, it is a little different having a woman in the van, but she is holding up awesomely! I don’t know a lot of women that could hang as well as she does. KW: How long have you been married? MC: A little over 3 and a half years now. MC: We have a dog named Charlie that I brought into the marriage. He’s a little long haired Chihuahua. He is so awesome! KW: My friends named their daughter Charlie. MC: Really?!? My wife and I love little girls with boy names. It is so cute! We talked about when we do have kids we want to name a girl Elliot. MC: Judah is a pretty name for a girl. KW: The one I like is Nevaeh. MC: That’s pretty funny. My friend Sonny from POD named his daughter Nevaeh. In fact, I think he was in the news for it. That name blew up after that. It is a really pretty name. KW: How long have you guys been around now? MC: We’ve been Islander now for 3 years, I’m horrible at math, but yeah, it has been like 3 years now. KW: (laughs) I checked out a few of your songs and you won me over immediately. MC: Thank you man! I really appreciate that. KW: It is a little different. Is the sound something you worked at or did it come natural? MC: We let it come naturally. We like making the music we enjoy. I listen to a lot of Depeche Mode and Bjork. (fist bump) Give it to me man! That’s the good stuff! We also listen to the more abrasive stuff; our guitarist listens to a lot of Dillinger Escape Plan. We are just kind of all over the place. We just try to make the music we enjoy. KW: What is the age range in the band? MC: I’m 28! I can’t remember all the ages of the other guys. I’ve never been really good at numbers. I actually thought I was 28 for a whole year that I wasn’t. I was about to turn 28 and I told everybody that I going to turn 29. My wife was like, “you’re turning 28.” We did the math and I was turning 28. So, this year I’m turning 29, so I feel like I’ve turned 28 twice. KW: Been a long tour huh? MC: (laughs) No, no! (laughs) If I forget how old I am, I forget how old I am. I will just stay young. KW: It doesn’t matter. Once you hit 21 it doesn’t matter anymore. It is just a blur after that. KW: Have you guys gotten a chance to get out and about in Chicago? MC: Not today, our label (Victory Records) is based here in Chicago so we’ve hung out here a good bit. We’ve shot videos here and we got to eat the Chicago hot dogs, the Chocolate Cake Milk Shake at Portillo’s, the deep dish pizza; so we got to experience quite a bit out here. Today though, we’ve just really been at the fest. KW: What’s your favorite thing that you’ve seen here in Chicago? MC: Like, out of all the things I’ve seen here in Chicago? MC: I got to see the Family Matters house! I got my picture taken in front of it. My wife and I watch 90’s sitcoms at home all the time. Family Matters is one of my favorites! KW: Did you ever see the movie “Stir of Echoes” with Kevin Bacon? MC: I’ve heard of it, but I haven’t seen it. KW: I’ve been in the neighborhood that that was filmed in. KW: When you see the movie and walk through it does give you that creepy vibe. MC: I’ll have to check that out! KW: Have you ever played the…uh…what is the name of that place on the Southside? I completely had a brain fart. My brain just sharted. KW: It’s, something Rockhouse on the Southside. MC: Is that in Joliet? KW: Yeah, everybody plays Mojo’s. MC: I’m pretty sure it was Mojo’s. KW: That’s a place that you could get your van broken into. MC: (laughs) Is it really? Well, when we played there last year it was freezing cold outside. I’d assume that everyone who would break into a van was inside trying to stay warm. KW: (laughs) It is worse in the summer. There is a rumor going around that Chicago is now the murder capital. KW: Yeah! So, how many albums have you released now? MC: Violence and Destruction is our debut album; it has been out since July 8th. We’ve had 2 EP’s and an independent release. KW: Then that wasn’t your first. MC: (laughs) Yeah, but those are just EP’s. This was our first actual album, like, A RECORD! You know man? It is like our real introduction. KW: I got you. How do fans seem to receive Islander? MC: They have been awesome! It is weird for little ‘ol us from South Carolina to come to California or Chicago and see people singing our lyrics back to us, we’re just like wow; this is impacting people. It is just weird for people to do that to me, but I do that to bands too. I write the lyrics in the bathroom or lying on my bed and all these people are singing them back. It is just cool! KW: Anybody at home you want to shout out too? MC: My dog Charlie, WHAT’S UP! I can’t wait to have playtime with you! My Grandma, my Mom and Dad and my whole family; PEACE, love you guys! It’s been a pleasure talking to you! KW: For us too! Thank you. I simply want to tell you that I am just new to blogging and site-building and seriously enjoyed your web blog. Most likely I’m want to bookmark your blog post . You absolutely have beneficial articles and reviews. With thanks for sharing with us your web page. you’re in reality a good webmaster. The website loading velocity is amazing. It sort of feels that you are doing any distinctive trick. Moreover, The contents are masterpiece. you have done a magnificent activity on this topic! certainly like your website however you have to take a look at the spelling on several of your posts. A number of them are rife with spelling problems and I find it very troublesome to tell the reality nevertheless I¡¦ll certainly come back again. Hiya, I’m really glad I’ve found this information. Today bloggers publish only about gossips and web and this is really annoying. A good website with exciting content, that is what I need. Thank you for keeping this web-site, I’ll be visiting it. Do you do newsletters? Can not find it. Definitely, what a splendid site and informative posts, I will bookmark your blog.Best Regards! I became honored to receive a call from my friend instantly he noticed the important suggestions shared on the site. Browsing your blog post article is a real great experience. Thank you for considering readers much like me, and I would like for you good accomplishment for a professional in this subject. I have been exploring for a bit for any high-quality articles or weblog posts in this kind of house . Exploring in Yahoo I ultimately stumbled upon this site. Studying this information So i am glad to convey that I’ve a very excellent uncanny feeling I came upon exactly what I needed. I most definitely will make sure to do not forget this web site and provides it a glance on a relentless basis. Somebody essentially assist to make significantly posts I might state. That is the first time I frequented your website page and up to now? I surprised with the research you made to create this particular publish extraordinary. Magnificent activity! I want to show thanks to the writer for rescuing me from such a condition. As a result of looking out through the world wide web and seeing strategies that were not beneficial, I was thinking my life was well over. Existing without the answers to the difficulties you’ve fixed all through your entire post is a serious case, as well as the ones which could have adversely affected my career if I had not come across the website. Your actual knowledge and kindness in dealing with every part was excellent. I don’t know what I would’ve done if I hadn’t discovered such a subject like this. I’m able to now look ahead to my future. Thanks for your time so much for the impressive and results-oriented help. I will not hesitate to endorse your blog to anyone who needs to have recommendations about this area. Wow, incredible weblog layout! How lengthy have you been running a blog for? you make running a blog look easy. The total glance of your web site is great, as neatly as the content material! Thanks for every other informative website. The place else may just I get that kind of information written in such a perfect approach? I have a project that I am simply now working on, and I’ve been at the glance out for such information. Simply want to say your article is as amazing. The clearness in your post is just cool and i can assume you are an expert on this subject. Fine with your permission let me to grab your RSS feed to keep up to date with forthcoming post. Thanks a million and please carry on the gratifying work. I am writing to let you understand what a extraordinary encounter my daughter encountered browsing your web page. She came to find lots of issues, not to mention how it is like to possess an amazing helping nature to have many people effortlessly know some complicated things. You really surpassed people’s expectations. Many thanks for distributing these essential, healthy, educational and also easy tips on your topic to Evelyn. Just want to say your article is as astonishing. The clearness in your post is just nice and i could assume you are an expert on this subject. Fine with your permission allow me to grab your RSS feed to keep up to date with forthcoming post. Thanks a million and please continue the enjoyable work. I like the helpful info you provide in your articles. I’ll bookmark your weblog and check again here regularly. I’m quite certain I will learn a lot of new stuff right here! Best of luck for the next! Some genuinely nice and useful info on this web site, too I conceive the style has got great features. you’re in reality a just right webmaster. The website loading pace is amazing. It seems that you’re doing any distinctive trick. Also, The contents are masterpiece. you’ve performed a excellent activity in this topic! Thank you for another magnificent article. The place else could anyone get that type of info in such a perfect means of writing? I’ve a presentation subsequent week, and I’m on the search for such info. wonderful publish, very informative. I wonder why the opposite experts of this sector do not realize this. You must proceed your writing. I’m sure, you’ve a huge readers’ base already! hi!,I like your writing so a lot! percentage we communicate extra about your post on AOL? I require an expert on this area to unravel my problem. Maybe that is you! Having a look ahead to peer you. Thank you for sharing superb informations. Your web site is very cool. I’m impressed by the details that you have on this web site. It reveals how nicely you perceive this subject. Bookmarked this web page, will come back for extra articles. You, my friend, ROCK! I found just the information I already searched everywhere and just couldn’t come across. What a great site. Fantastic goods from you, man. I have understand your stuff previous to and you are just extremely magnificent. I really like what you’ve acquired here, really like what you’re stating and the way in which you say it. You make it enjoyable and you still take care of to keep it smart. I cant wait to read much more from you. This is really a wonderful website. My husband and i ended up being absolutely comfortable when John managed to finish off his web research with the ideas he discovered when using the blog. It is now and again perplexing just to be giving away instructions that many the others could have been trying to sell. We grasp we have got the writer to give thanks to for this. Those illustrations you have made, the straightforward site menu, the friendships you make it possible to foster – it’s got mostly fantastic, and it’s really facilitating our son in addition to us consider that that issue is exciting, and that’s tremendously important. Thank you for the whole lot! Some truly good info , Sword lily I observed this. “Always be ready to speak your mind and a base man will avoid you.” by William Blake. I am no longer sure where you’re getting your information, but great topic. I needs to spend a while finding out much more or figuring out more. Thank you for magnificent info I used to be in search of this information for my mission. I enjoy you because of your own hard work on this website. Betty loves getting into investigation and it’s really easy to understand why. A number of us know all about the dynamic tactic you deliver efficient guidance on this web blog and encourage participation from the others on this theme so our own child is without a doubt studying a lot. Take pleasure in the remaining portion of the new year. You are always conducting a brilliant job. I not to mention my buddies ended up looking through the best thoughts from your website and then unexpectedly developed a terrible suspicion I had not expressed respect to the site owner for those secrets. All of the people are actually as a result very interested to study all of them and have now quite simply been taking advantage of these things. We appreciate you being very considerate and then for pick out this sort of amazing topics most people are really needing to be aware of. Our own sincere apologies for not expressing appreciation to earlier. Great assistance and really true. One of the vital essential things bloggers, or any kind of business, are capable of doing is try not to quit. Even if instances are powerful it is important to be there for your site visitors and prospects because they are able to remember you in a very good light once things become better and you could be awarded for your work. I just wanted to write down a small note so as to express gratitude to you for all of the stunning facts you are giving out on this website. My time-consuming internet look up has now been compensated with useful know-how to exchange with my best friends. I ‘d assert that many of us visitors are unequivocally lucky to be in a perfect network with many marvellous people with good solutions. I feel pretty blessed to have encountered your entire site and look forward to so many more excellent times reading here. Thank you again for a lot of things. I have recently started a website, the information you provide on this web site has helped me tremendously. Thank you for all of your time & work. “Show me the man who keeps his house in hand, He’s fit for public authority.” by Sophocles. Its fantastic as your other articles : D, appreciate it for putting up. “If Christ were here now there is one thing he would not be–a christian.” by Mark Twain. You have noted very interesting points ! ps decent internet site . “To grow mature is to separate more distinctly, to connect more closely.” by Hugo Von Hofmannsthal. Great – I should definitely pronounce, impressed with your web site. I had no trouble navigating through all tabs as well as related information ended up being truly simple to do to access. I recently found what I hoped for before you know it at all. Reasonably unusual. Is likely to appreciate it for those who add forums or anything, web site theme . a tones way for your customer to communicate. Excellent task. Somebody necessarily lend a hand to make seriously articles I would state. That is the very first time I frequented your website page and to this point? I surprised with the research you made to make this particular publish incredible. Fantastic activity! My wife and i ended up being absolutely fortunate that Ervin managed to finish off his preliminary research using the ideas he gained from your very own web site. It is now and again perplexing to simply continually be handing out steps that many people today might have been making money from. And we also consider we now have you to thank for that. The illustrations you have made, the simple web site menu, the friendships you help create – it is everything impressive, and it is making our son and our family know that that article is cool, and that’s very essential. Thank you for the whole lot! Some truly fantastic articles on this website, appreciate it for contribution. “An alcoholic is someone you don’t like who drinks as much as you do.” by Dylan Thomas. I precisely desired to appreciate you again. I do not know what I might have achieved in the absence of the type of ideas discussed by you relating to such subject. It had been the traumatic problem in my position, nevertheless taking note of the very specialised avenue you solved that took me to cry over contentment. I will be thankful for this assistance and even hope you find out what a powerful job that you are getting into educating most people with the aid of a blog. I am sure you haven’t encountered all of us. You actually make it seem so easy with your presentation but I to find this topic to be actually something that I think I would by no means understand. It seems too complex and extremely large for me. I am having a look ahead in your subsequent submit, I will try to get the cling of it! Hiya, I’m really glad I have found this information. Nowadays bloggers publish just about gossip and net stuff and this is actually annoying. A good website with interesting content, that is what I need. Thanks for making this website, and I will be visiting again. Do you do newsletters by email? Hey there. I found your site by the use of Google even as searching for a comparable subject, your site came up. It looks good. I have bookmarked it in my google bookmarks to come back then. Hi there. I found your site by way of Google even as searching for a similar subject, your site came up. It looks good. I have bookmarked it in my google bookmarks to come back then. A person essentially assist to make seriously posts I’d state. This is the very first time I frequented your web page and so far? I amazed with the research you made to make this actual submit incredible. Magnificent task! Hello there. I discovered your site by the use of Google at the same time as searching for a similar matter, your site got here up. It appears great. I have bookmarked it in my google bookmarks to visit then. Hiya, I am really glad I have found this information. Today bloggers publish only about gossip and web stuff and this is actually annoying. A good web site with interesting content, that is what I need. Thanks for making this website, and I’ll be visiting again. Do you do newsletters by email? Hey there. I discovered your web site by way of Google even as looking for a similar subject, your site got here up. It appears great. I’ve bookmarked it in my google bookmarks to come back then. Hello there. I discovered your web site by the use of Google while searching for a similar topic, your website got here up. It looks good. I’ve bookmarked it in my google bookmarks to come back then. Hello there. I found your web site via Google whilst searching for a related subject, your web site came up. It appears great. I have bookmarked it in my google bookmarks to visit then. Hiya, I am really glad I’ve found this information. Today bloggers publish just about gossip and internet stuff and this is actually annoying. A good website with exciting content, that is what I need. Thank you for making this site, and I’ll be visiting again. Do you do newsletters by email? Hiya, I am really glad I’ve found this info. Today bloggers publish only about gossip and internet stuff and this is actually annoying. A good website with exciting content, that’s what I need. Thank you for making this website, and I’ll be visiting again. Do you do newsletters by email? Hiya, I am really glad I’ve found this information. Today bloggers publish only about gossip and net stuff and this is actually annoying. A good site with exciting content, this is what I need. Thank you for making this web-site, and I’ll be visiting again. Do you do newsletters by email? Hi there. I discovered your site via Google at the same time as searching for a comparable subject, your web site came up. It appears good. I’ve bookmarked it in my google bookmarks to come back then. Hiya, I’m really glad I’ve found this info. Nowadays bloggers publish only about gossip and internet stuff and this is actually annoying. A good web site with exciting content, this is what I need. Thank you for making this web-site, and I’ll be visiting again. Do you do newsletters by email? Hiya, I’m really glad I’ve found this information. Today bloggers publish only about gossip and web stuff and this is actually annoying. A good blog with exciting content, this is what I need. Thanks for making this web site, and I’ll be visiting again. Do you do newsletters by email? Hiya, I am really glad I’ve found this info. Today bloggers publish only about gossip and net stuff and this is actually frustrating. A good website with interesting content, this is what I need. Thank you for making this web-site, and I will be visiting again. Do you do newsletters by email? I’ll immediately seize your rss as I can’t find your email subscription hyperlink or e-newsletter service. Do you have any? Please permit me understand so that I may subscribe. Thanks. Hiya, I am really glad I have found this information. Nowadays bloggers publish only about gossip and web stuff and this is really annoying. A good site with interesting content, that is what I need. Thanks for making this website, and I’ll be visiting again. Do you do newsletters by email? Hey there. I discovered your website by the use of Google while looking for a comparable matter, your website got here up. It appears good. I have bookmarked it in my google bookmarks to visit then. Hiya, I am really glad I’ve found this info. Nowadays bloggers publish just about gossip and web stuff and this is really annoying. A good website with exciting content, that’s what I need. Thanks for making this web-site, and I will be visiting again. Do you do newsletters by email? Hiya, I’m really glad I’ve found this info. Nowadays bloggers publish just about gossip and internet stuff and this is actually frustrating. A good website with interesting content, this is what I need. Thank you for making this web site, and I will be visiting again. Do you do newsletters by email? Hiya, I am really glad I have found this info. Nowadays bloggers publish only about gossip and net stuff and this is actually irritating. A good website with interesting content, this is what I need. Thank you for making this web-site, and I’ll be visiting again. Do you do newsletters by email? Hey there. I found your web site by means of Google even as searching for a similar matter, your web site came up. It looks good. I’ve bookmarked it in my google bookmarks to visit then. Hey there. I found your blog by way of Google whilst looking for a related subject, your site came up. It seems to be great. I’ve bookmarked it in my google bookmarks to visit then. Hiya, I am really glad I have found this info. Nowadays bloggers publish just about gossip and net stuff and this is actually irritating. A good blog with exciting content, that is what I need. Thank you for making this website, and I will be visiting again. Do you do newsletters by email? Hi there. I discovered your website by the use of Google at the same time as searching for a similar topic, your web site got here up. It appears great. I have bookmarked it in my google bookmarks to visit then. Hiya, I’m really glad I’ve found this information. Nowadays bloggers publish just about gossip and web stuff and this is really irritating. A good web site with interesting content, this is what I need. Thank you for making this site, and I’ll be visiting again. Do you do newsletters by email? Hi there. I discovered your website by the use of Google while looking for a similar topic, your website got here up. It appears to be great. I have bookmarked it in my google bookmarks to come back then. Hiya, I’m really glad I have found this info. Today bloggers publish only about gossip and internet stuff and this is really irritating. A good website with interesting content, that is what I need. Thanks for making this web-site, and I will be visiting again. Do you do newsletters by email? Hello there. I found your site via Google at the same time as searching for a similar topic, your web site came up. It looks good. I’ve bookmarked it in my google bookmarks to visit then. Hi there. I found your web site by the use of Google whilst searching for a related subject, your website got here up. It seems good. I have bookmarked it in my google bookmarks to come back then. naturally like your website but you have to check the spelling on quite a few of your posts. Many of them are rife with spelling problems and I to find it very bothersome to inform the reality nevertheless I will surely come back again. you are actually a good webmaster. The website loading speed is incredible. It seems that you are doing any distinctive trick. Moreover, The contents are masterwork. you’ve done a magnificent task in this subject! I¡¦ve learn some excellent stuff here. Definitely worth bookmarking for revisiting. I wonder how much effort you set to make the sort of excellent informative website. We absolutely love your blog and find most of your post’s to be exactly what I’m looking for. Does one offer guest writers to write content in your case? I wouldn’t mind producing a post or elaborating on many of the subjects you write with regards to here. Again, awesome blog! Hello there. I discovered your website by way of Google while looking for a similar topic, your web site got here up. It seems great. I have bookmarked it in my google bookmarks to visit then. Hiya, I am really glad I have found this info. Today bloggers publish just about gossip and net stuff and this is actually annoying. A good site with interesting content, this is what I need. Thank you for making this web-site, and I will be visiting again. Do you do newsletters by email? Hiya, I’m really glad I’ve found this info. Nowadays bloggers publish only about gossip and net stuff and this is actually irritating. A good web site with exciting content, this is what I need. Thanks for making this website, and I’ll be visiting again. Do you do newsletters by email? Hello there. I discovered your website by means of Google at the same time as looking for a comparable matter, your web site came up. It seems good. I’ve bookmarked it in my google bookmarks to visit then. Hiya, I am really glad I have found this information. Today bloggers publish only about gossip and net stuff and this is actually annoying. A good site with exciting content, this is what I need. Thank you for making this web-site, and I’ll be visiting again. Do you do newsletters by email? Hiya, I’m really glad I’ve found this information. Nowadays bloggers publish just about gossip and internet stuff and this is really frustrating. A good blog with exciting content, this is what I need. Thanks for making this website, and I will be visiting again. Do you do newsletters by email? Hey there. I found your web site via Google while looking for a similar matter, your website came up. It appears to be good. I’ve bookmarked it in my google bookmarks to come back then. Hey there. I found your blog by way of Google at the same time as searching for a similar subject, your site came up. It appears great. I’ve bookmarked it in my google bookmarks to come back then. Hi there. I discovered your web site by way of Google at the same time as searching for a comparable topic, your web site got here up. It seems great. I have bookmarked it in my google bookmarks to come back then. Hey there. I discovered your website by means of Google at the same time as searching for a comparable matter, your web site got here up. It seems to be good. I have bookmarked it in my google bookmarks to visit then. Hey there. I found your site by means of Google even as searching for a comparable matter, your website got here up. It seems to be great. I have bookmarked it in my google bookmarks to visit then. Hello there. I found your site via Google while searching for a comparable matter, your website got here up. It appears good. I’ve bookmarked it in my google bookmarks to come back then. Hiya, I’m really glad I have found this info. Nowadays bloggers publish just about gossip and net stuff and this is actually annoying. A good web site with interesting content, this is what I need. Thanks for making this web-site, and I’ll be visiting again. Do you do newsletters by email? Hiya, I’m really glad I have found this info. Nowadays bloggers publish only about gossip and net stuff and this is really annoying. A good website with interesting content, that’s what I need. Thank you for making this site, and I will be visiting again. Do you do newsletters by email? Hiya, I’m really glad I have found this information. Today bloggers publish just about gossip and internet stuff and this is actually annoying. A good website with exciting content, this is what I need. Thanks for making this website, and I’ll be visiting again. Do you do newsletters by email? Hiya, I am really glad I have found this information. Nowadays bloggers publish only about gossip and web stuff and this is really frustrating. A good blog with exciting content, that’s what I need. Thank you for making this site, and I will be visiting again. Do you do newsletters by email? you’re in point of fact a good webmaster. The website loading speed is amazing. It sort of feels that you’re doing any distinctive trick. Furthermore, The contents are masterwork. you have done a great task in this topic! Hey! Someone in my Facebook group shared this website with us so I came to look it over. I’m definitely enjoying the information. I’m book-marking and will be tweeting this to my followers! Fantastic blog and amazing style and design. My coder is trying to convince me to move to .net from PHP. I have always disliked the idea because of the costs. But he’s tryiong none the less. I’ve been using WordPress on numerous websites for about a year and am concerned about switching to another platform. I have heard fantastic things about blogengine.net. Is there a way I can import all my wordpress content into it? Any kind of help would be greatly appreciated! Have you ever thought about publishing an e-book or guest authoring on other blogs? I have a blog based on the same topics you discuss and would really like to have you share some stories/information. I know my visitors would appreciate your work. If you are even remotely interested, feel free to shoot me an e mail. Hello! I know this is kinda off topic but I’d figured I’d ask. Would you be interested in exchanging links or maybe guest writing a blog post or vice-versa? My site discusses a lot of the same subjects as yours and I believe we could greatly benefit from each other. If you’re interested feel free to send me an email. I look forward to hearing from you! Superb blog by the way! Hey there! I know this is kinda off topic however , I’d figured I’d ask. Would you be interested in trading links or maybe guest authoring a blog article or vice-versa? My blog covers a lot of the same topics as yours and I believe we could greatly benefit from each other. If you are interested feel free to shoot me an email. I look forward to hearing from you! Superb blog by the way! Hiya, I’m really glad I have found this information. Today bloggers publish just about gossip and net stuff and this is actually frustrating. A good web site with exciting content, that is what I need. Thank you for making this web-site, and I’ll be visiting again. Do you do newsletters by email? Hello there. I discovered your site by means of Google at the same time as looking for a similar matter, your web site came up. It appears to be good. I’ve bookmarked it in my google bookmarks to visit then. Hiya, I’m really glad I have found this info. Today bloggers publish just about gossip and web stuff and this is really frustrating. A good web site with exciting content, that’s what I need. Thanks for making this site, and I will be visiting again. Do you do newsletters by email? Hey there. I found your website by means of Google while looking for a related matter, your web site came up. It seems good. I have bookmarked it in my google bookmarks to visit then. Somebody essentially help to make critically articles I might state. This is the very first time I frequented your web page and thus far? I amazed with the analysis you made to make this particular publish extraordinary. Wonderful task! Woah! I’m really enjoying the template/theme of this site. It’s simple, yet effective. A lot of times it’s tough to get that “perfect balance” between superb usability and appearance. I must say that you’ve done a very good job with this. Additionally, the blog loads super quick for me on Opera. Outstanding Blog! Hello! I realize this is kind of off-topic however I had to ask. Does building a well-established website such as yours take a lot of work? I’m completely new to running a blog but I do write in my diary everyday. I’d like to start a blog so I can share my own experience and thoughts online. Please let me know if you have any recommendations or tips for brand new aspiring blog owners. Thankyou! Hi there. I discovered your site by way of Google at the same time as looking for a similar matter, your website got here up. It seems great. I have bookmarked it in my google bookmarks to visit then. Hi there. I found your website by the use of Google while searching for a related matter, your web site got here up. It appears great. I have bookmarked it in my google bookmarks to come back then. Hey there. I found your web site by way of Google even as looking for a related matter, your web site came up. It looks good. I’ve bookmarked it in my google bookmarks to visit then. you are actually a good webmaster. The web site loading pace is amazing. It kind of feels that you’re doing any distinctive trick. Also, The contents are masterwork. you’ve performed a wonderful activity on this subject! Hey there. I found your website by means of Google even as looking for a comparable subject, your web site got here up. It seems great. I’ve bookmarked it in my google bookmarks to come back then. Hello there. I discovered your web site by means of Google while looking for a related subject, your web site came up. It looks good. I have bookmarked it in my google bookmarks to come back then. Generally I do not read article on blogs, but I wish to say that this write-up very pressured me to check out and do it! Your writing style has been surprised me. Thank you, very nice article. I am also writing to make you know of the outstanding experience our child encountered viewing the blog. She picked up some issues, which include how it is like to have a very effective giving style to have certain people without difficulty learn about various hard to do topics. You truly exceeded our expected results. Many thanks for coming up with these warm and helpful, dependable, explanatory and also cool tips on your topic to Ethel. Hi my loved one! I want to say that this post is awesome, nice written and come with approximately all significant infos. I would like to see extra posts like this . Thank you a lot for providing individuals with an extremely superb possiblity to read articles and blog posts from this blog. It’s always so pleasant and also jam-packed with a great time for me and my office colleagues to search your site at minimum 3 times in one week to see the new things you will have. And lastly, I’m just certainly amazed considering the astonishing creative ideas you give. Certain 2 points in this posting are in truth the most suitable we have all had. Hello there. I discovered your website by means of Google even as searching for a related topic, your website came up. It appears great. I have bookmarked it in my google bookmarks to visit then. Hi there. I found your website by way of Google at the same time as looking for a comparable topic, your web site got here up. It appears good. I have bookmarked it in my google bookmarks to come back then. Hiya, I am really glad I’ve found this information. Today bloggers publish only about gossip and internet stuff and this is actually irritating. A good blog with interesting content, that is what I need. Thanks for making this website, and I will be visiting again. Do you do newsletters by email? Hi there. I discovered your website by way of Google while searching for a comparable matter, your website came up. It looks good. I’ve bookmarked it in my google bookmarks to come back then. Hiya, I’m really glad I have found this info. Nowadays bloggers publish only about gossip and net stuff and this is actually frustrating. A good website with interesting content, that is what I need. Thank you for making this web-site, and I’ll be visiting again. Do you do newsletters by email? Hiya, I’m really glad I’ve found this info. Today bloggers publish just about gossip and internet stuff and this is really annoying. A good web site with interesting content, this is what I need. Thanks for making this web site, and I’ll be visiting again. Do you do newsletters by email? Hey there. I found your blog via Google even as searching for a related matter, your web site got here up. It seems great. I have bookmarked it in my google bookmarks to come back then. Hi there. I found your blog via Google while searching for a similar topic, your web site got here up. It seems good. I’ve bookmarked it in my google bookmarks to come back then. Hiya, I’m really glad I have found this info. Nowadays bloggers publish just about gossip and net stuff and this is really irritating. A good web site with exciting content, this is what I need. Thanks for making this web site, and I will be visiting again. Do you do newsletters by email? I have been browsing on-line more than 3 hours these days, yet I by no means discovered any fascinating article like yours. It is pretty value enough for me. In my view, if all web owners and bloggers made good content material as you did, the web might be a lot more helpful than ever before. “I thank God for my handicaps, for through them, I have found myself, my work and my God.” by Hellen Keller. Hello there. I discovered your blog via Google at the same time as looking for a related subject, your site got here up. It appears to be good. I have bookmarked it in my google bookmarks to come back then. Hi there. I discovered your site by way of Google at the same time as searching for a comparable subject, your website got here up. It appears great. I have bookmarked it in my google bookmarks to visit then. Hi there. I discovered your web site via Google even as looking for a comparable topic, your web site got here up. It seems to be great. I have bookmarked it in my google bookmarks to come back then. Hey there. I discovered your web site via Google even as looking for a comparable topic, your site got here up. It appears good. I’ve bookmarked it in my google bookmarks to visit then. Hiya, I’m really glad I have found this information. Nowadays bloggers publish only about gossip and web stuff and this is really irritating. A good blog with interesting content, this is what I need. Thanks for making this web site, and I’ll be visiting again. Do you do newsletters by email? Hey there. I discovered your site by means of Google while searching for a related matter, your web site came up. It seems to be great. I’ve bookmarked it in my google bookmarks to visit then. Hey there. I found your website by means of Google even as looking for a comparable subject, your site came up. It seems good. I’ve bookmarked it in my google bookmarks to visit then. Hey there. I discovered your site by means of Google even as looking for a related topic, your website came up. It looks great. I have bookmarked it in my google bookmarks to come back then. I’m also commenting to let you be aware of what a impressive experience my friend’s daughter gained reading your blog. She picked up a wide variety of things, including what it is like to have a very effective teaching style to make many others quite simply fully understand a number of extremely tough matters. You really exceeded readers’ expectations. Thanks for providing such great, safe, educational and as well as cool thoughts on that topic to Gloria. Hi there. I found your blog via Google at the same time as looking for a similar topic, your website got here up. It seems good. I have bookmarked it in my google bookmarks to visit then. Hi there. I discovered your site by the use of Google at the same time as searching for a related subject, your web site got here up. It seems to be great. I have bookmarked it in my google bookmarks to visit then. Hello there. I discovered your website by means of Google at the same time as searching for a similar matter, your website got here up. It seems good. I have bookmarked it in my google bookmarks to visit then. Hello there. I discovered your site by the use of Google while looking for a similar topic, your web site came up. It seems to be great. I have bookmarked it in my google bookmarks to come back then. I have read a few good stuff here. Certainly value bookmarking for revisiting. I surprise how a lot attempt you place to create this type of wonderful informative website. Hello there. I found your blog by way of Google at the same time as looking for a comparable subject, your web site got here up. It seems to be good. I’ve bookmarked it in my google bookmarks to visit then. Hiya, I am really glad I’ve found this info. Today bloggers publish just about gossip and net stuff and this is really frustrating. A good web site with interesting content, that’s what I need. Thanks for making this web-site, and I will be visiting again. Do you do newsletters by email? I enjoy you because of your whole effort on this blog. My mother takes pleasure in making time for investigation and it is easy to see why. All of us hear all relating to the lively manner you produce both interesting and useful tips and tricks on this web site and as well invigorate participation from other people about this area then our daughter has always been starting to learn a lot. Have fun with the rest of the year. Your performing a superb job. Hey there. I found your web site via Google at the same time as searching for a related matter, your website got here up. It seems to be great. I’ve bookmarked it in my google bookmarks to visit then. Hiya, I am really glad I have found this info. Nowadays bloggers publish only about gossip and net stuff and this is actually irritating. A good website with exciting content, that is what I need. Thank you for making this website, and I’ll be visiting again. Do you do newsletters by email? Hey there. I found your site by the use of Google even as searching for a similar topic, your site came up. It appears to be great. I have bookmarked it in my google bookmarks to visit then. Hiya, I’m really glad I have found this information. Nowadays bloggers publish just about gossip and net stuff and this is really frustrating. A good blog with interesting content, that is what I need. Thank you for making this web-site, and I will be visiting again. Do you do newsletters by email? Hiya, I am really glad I’ve found this information. Today bloggers publish just about gossip and internet stuff and this is actually annoying. A good blog with interesting content, that’s what I need. Thank you for making this site, and I’ll be visiting again. Do you do newsletters by email? Hiya, I am really glad I’ve found this information. Today bloggers publish just about gossip and net stuff and this is actually frustrating. A good blog with exciting content, that is what I need. Thank you for making this web-site, and I’ll be visiting again. Do you do newsletters by email? I conceive this web site has some real superb info for everyone :D. “Nothing great was ever achieved without enthusiasm.” by Ralph Waldo Emerson. Magnificent web site. Lots of helpful information here. I¡¦m sending it to a few buddies ans also sharing in delicious. And certainly, thank you to your effort! My wife and i were satisfied when Louis could conclude his investigations from your precious recommendations he acquired out of your web pages. It’s not at all simplistic just to possibly be giving away tips which the rest could have been selling. Therefore we already know we have you to give thanks to for this. The type of explanations you’ve made, the simple blog navigation, the friendships you can make it easier to engender – it’s got mostly amazing, and it is facilitating our son in addition to the family reckon that this theme is satisfying, and that is very important. Thanks for the whole lot! Hi there. I found your site via Google even as searching for a comparable topic, your website came up. It appears good. I have bookmarked it in my google bookmarks to visit then. I do believe all the concepts you have offered in your post. They are really convincing and will certainly work. Still, the posts are very brief for starters. Could you please prolong them a little from subsequent time? Thanks for the post. I’m really enjoying the theme/design of your weblog. Do you ever run into any web browser compatibility issues? A few of my blog readers have complained about my site not working correctly in Explorer but looks great in Opera. Do you have any tips to help fix this issue? fantastic post, very informative. I ponder why the opposite specialists of this sector don’t realize this. You must continue your writing. I am confident, you have a huge readers’ base already! I conceive this internet site has got some rattling fantastic information for everyone :D. “When you get a thing the way you want it, leave it alone.” by Sir Winston Leonard Spenser Churchill. Hello! I’ve been reading your website for a while now and finally got the courage to go ahead and give you a shout out from Porter Texas! Just wanted to tell you keep up the excellent work! First of all I want to say wonderful blog! I had a quick question that I’d like to ask if you don’t mind. I was curious to find out how you center yourself and clear your thoughts before writing. I’ve had a tough time clearing my mind in getting my ideas out. I truly do enjoy writing however it just seems like the first 10 to 15 minutes tend to be lost just trying to figure out how to begin. Any recommendations or tips? Many thanks! Hello there. I discovered your site by means of Google even as searching for a related matter, your web site got here up. It appears great. I’ve bookmarked it in my google bookmarks to visit then. Hello there. I discovered your blog by means of Google even as looking for a comparable topic, your site came up. It seems to be good. I have bookmarked it in my google bookmarks to come back then. Hi there. I found your web site by means of Google whilst looking for a related matter, your site got here up. It seems great. I have bookmarked it in my google bookmarks to come back then. It is perfect time to make some plans for the future and it’s time to be happy. I’ve read this post and if I could I wish to suggest you few interesting things or tips. Perhaps you could write next articles referring to this article. I desire to read more things about it! Hello there. I found your site via Google even as searching for a related topic, your web site came up. It appears to be good. I’ve bookmarked it in my google bookmarks to come back then. Hi, Neat post. There is an issue together with your web site in internet explorer, might test this… IE still is the market leader and a big component of folks will omit your great writing due to this problem. Hiya, I’m really glad I’ve found this information. Nowadays bloggers publish only about gossip and internet stuff and this is really annoying. A good web site with exciting content, this is what I need. Thanks for making this site, and I’ll be visiting again. Do you do newsletters by email? Hello there. I discovered your site by the use of Google whilst looking for a comparable topic, your web site came up. It seems good. I have bookmarked it in my google bookmarks to visit then. Hiya, I am really glad I’ve found this information. Nowadays bloggers publish just about gossip and web stuff and this is actually frustrating. A good website with interesting content, that’s what I need. Thank you for making this site, and I’ll be visiting again. Do you do newsletters by email? Hiya, I am really glad I’ve found this info. Nowadays bloggers publish only about gossip and web stuff and this is really frustrating. A good website with interesting content, this is what I need. Thanks for making this web-site, and I’ll be visiting again. Do you do newsletters by email? Hiya, I am really glad I’ve found this information. Nowadays bloggers publish just about gossip and internet stuff and this is actually irritating. A good site with interesting content, this is what I need. Thanks for making this web site, and I will be visiting again. Do you do newsletters by email? I really enjoy examining on this website, it has good blog posts. “A short saying oft contains much wisdom.” by Sophocles. Hiya, I am really glad I’ve found this info. Today bloggers publish only about gossip and net stuff and this is really annoying. A good website with exciting content, that’s what I need. Thank you for making this web-site, and I’ll be visiting again. Do you do newsletters by email? Usually I don’t learn post on blogs, however I would like to say that this write-up very pressured me to try and do it! Your writing style has been amazed me. Thank you, quite great article. Hello there. I found your website by the use of Google even as searching for a similar topic, your web site came up. It looks great. I have bookmarked it in my google bookmarks to visit then. Hiya, I am really glad I’ve found this info. Nowadays bloggers publish only about gossip and web stuff and this is actually irritating. A good blog with exciting content, this is what I need. Thank you for making this web site, and I will be visiting again. Do you do newsletters by email? Hi there. I found your website by the use of Google while looking for a related matter, your web site got here up. It seems to be great. I have bookmarked it in my google bookmarks to come back then. Hiya, I’m really glad I have found this information. Nowadays bloggers publish only about gossip and internet stuff and this is actually irritating. A good web site with interesting content, this is what I need. Thank you for making this website, and I will be visiting again. Do you do newsletters by email? Hello there. I discovered your blog by way of Google at the same time as searching for a similar matter, your web site came up. It looks good. I have bookmarked it in my google bookmarks to visit then. I carry on listening to the news lecture about getting free online grant applications so I have been looking around for the finest site to get one. Could you advise me please, where could i find some? Hi there. I discovered your site by way of Google even as looking for a similar matter, your web site came up. It appears great. I have bookmarked it in my google bookmarks to come back then. Hiya, I’m really glad I’ve found this info. Today bloggers publish only about gossip and net stuff and this is actually annoying. A good blog with interesting content, that’s what I need. Thanks for making this website, and I will be visiting again. Do you do newsletters by email? you’re actually a just right webmaster. The web site loading pace is incredible. It seems that you’re doing any unique trick. Moreover, The contents are masterwork. you’ve done a magnificent activity in this topic! Hiya, I’m really glad I’ve found this information. Nowadays bloggers publish just about gossip and web stuff and this is actually irritating. A good site with interesting content, this is what I need. Thank you for making this website, and I’ll be visiting again. Do you do newsletters by email? Hiya, I’m really glad I have found this information. Nowadays bloggers publish only about gossip and internet stuff and this is actually annoying. A good web site with interesting content, that’s what I need. Thanks for making this site, and I’ll be visiting again. Do you do newsletters by email? I truly wanted to type a brief message in order to thank you for some of the remarkable tips you are showing on this site. My rather long internet research has at the end been paid with incredibly good details to go over with my good friends. I would state that that many of us site visitors are quite lucky to live in a really good place with so many brilliant individuals with useful methods. I feel quite fortunate to have seen your website page and look forward to some more fun times reading here. Thank you once again for all the details. Thanks for any other magnificent post. The place else may just anybody get that type of information in such a perfect means of writing? I have a presentation next week, and I am at the search for such info. I would like to thnkx for the efforts you have put in writing this site. I am hoping the same high-grade blog post from you in the upcoming also. In fact your creative writing skills has encouraged me to get my own site now. Actually the blogging is spreading its wings fast. Your write up is a great example of it. Hi there. I found your website via Google even as searching for a related topic, your website got here up. It looks great. I’ve bookmarked it in my google bookmarks to come back then. Hello there. I discovered your web site by means of Google even as searching for a related subject, your web site came up. It looks great. I’ve bookmarked it in my google bookmarks to visit then. My husband and i felt really thrilled when Ervin could round up his survey from your precious recommendations he made out of your site. It’s not at all simplistic just to choose to be giving freely tactics which often other folks could have been making money from. And we figure out we’ve got the blog owner to give thanks to for this. The main illustrations you’ve made, the simple blog menu, the friendships you can give support to instill – it is all awesome, and it’s really facilitating our son and our family know that that article is pleasurable, and that is exceptionally pressing. Thank you for the whole lot! Hi there. I discovered your website by means of Google whilst looking for a related subject, your site came up. It seems great. I have bookmarked it in my google bookmarks to come back then. Hi there. I found your site by means of Google at the same time as looking for a related subject, your site got here up. It seems to be great. I have bookmarked it in my google bookmarks to visit then. Hi there. I found your website by means of Google at the same time as looking for a related topic, your web site came up. It appears to be great. I have bookmarked it in my google bookmarks to come back then. Hello there. I found your site via Google while looking for a related subject, your site got here up. It appears to be good. I’ve bookmarked it in my google bookmarks to come back then. Hiya, I am really glad I’ve found this information. Nowadays bloggers publish just about gossip and web stuff and this is really frustrating. A good web site with exciting content, this is what I need. Thank you for making this web site, and I will be visiting again. Do you do newsletters by email? you are really a good webmaster. The web site loading velocity is amazing. It kind of feels that you are doing any unique trick. Furthermore, The contents are masterwork. you’ve performed a excellent process in this topic! Hi there. I discovered your site by the use of Google while looking for a related topic, your site got here up. It appears to be good. I’ve bookmarked it in my google bookmarks to come back then. Hey there. I discovered your web site by way of Google even as searching for a comparable matter, your site came up. It seems to be good. I’ve bookmarked it in my google bookmarks to visit then. Hiya, I’m really glad I’ve found this info. Nowadays bloggers publish only about gossip and internet stuff and this is actually annoying. A good blog with interesting content, this is what I need. Thank you for making this web-site, and I will be visiting again. Do you do newsletters by email? Hello there. I discovered your site by the use of Google whilst looking for a comparable topic, your web site got here up. It appears to be good. I have bookmarked it in my google bookmarks to visit then. Hiya, I am really glad I have found this information. Nowadays bloggers publish just about gossip and internet stuff and this is really annoying. A good blog with exciting content, this is what I need. Thank you for making this website, and I’ll be visiting again. Do you do newsletters by email? Hiya, I am really glad I’ve found this information. Today bloggers publish only about gossip and internet stuff and this is actually irritating. A good site with exciting content, that’s what I need. Thank you for making this web-site, and I’ll be visiting again. Do you do newsletters by email? Hiya, I’m really glad I have found this info. Today bloggers publish only about gossip and web stuff and this is actually irritating. A good web site with interesting content, that’s what I need. Thank you for making this website, and I will be visiting again. Do you do newsletters by email? Hiya, I am really glad I’ve found this info. Nowadays bloggers publish just about gossip and internet stuff and this is really annoying. A good web site with interesting content, this is what I need. Thank you for making this site, and I’ll be visiting again. Do you do newsletters by email? Hi there. I found your site via Google even as looking for a related subject, your site got here up. It looks good. I have bookmarked it in my google bookmarks to come back then. F*ckin’ tremendous issues here. I’m very satisfied to peer your article. Thank you so much and i’m having a look forward to touch you. Will you kindly drop me a e-mail? Great amazing things here. I am very glad to peer your article. Thanks so much and i am looking ahead to contact you. Will you please drop me a e-mail? What i don’t realize is if truth be told how you are now not really much more well-preferred than you might be now. You are very intelligent. You recognize thus considerably when it comes to this topic, produced me in my opinion imagine it from numerous varied angles. Its like women and men are not fascinated except it¡¦s one thing to do with Woman gaga! Your personal stuffs nice. All the time deal with it up! Hi there. I discovered your web site by the use of Google whilst searching for a similar subject, your site got here up. It seems good. I’ve bookmarked it in my google bookmarks to visit then. Hiya, I am really glad I have found this information. Today bloggers publish just about gossip and net stuff and this is really frustrating. A good blog with exciting content, that is what I need. Thanks for making this site, and I’ll be visiting again. Do you do newsletters by email? Hiya, I am really glad I have found this info. Nowadays bloggers publish just about gossip and internet stuff and this is really irritating. A good site with interesting content, that’s what I need. Thank you for making this web site, and I will be visiting again. Do you do newsletters by email? Hiya, I’m really glad I have found this information. Nowadays bloggers publish only about gossip and web stuff and this is actually irritating. A good website with exciting content, this is what I need. Thank you for making this web-site, and I’ll be visiting again. Do you do newsletters by email? Hiya, I am really glad I have found this info. Nowadays bloggers publish just about gossip and web stuff and this is really irritating. A good site with exciting content, this is what I need. Thank you for making this site, and I will be visiting again. Do you do newsletters by email? Some really nice and utilitarian information on this website, besides I conceive the design and style contains superb features. Hey there. I found your blog by means of Google at the same time as searching for a similar topic, your web site came up. It seems good. I have bookmarked it in my google bookmarks to come back then. are discussing on the internet. You actually understand how to bring an issue to light and make it important. Hello there. I discovered your blog via Google even as looking for a similar matter, your website got here up. It seems to be good. I have bookmarked it in my google bookmarks to visit then. Hiya, I am really glad I’ve found this info. Today bloggers publish just about gossip and internet stuff and this is actually irritating. A good web site with exciting content, this is what I need. Thank you for making this web-site, and I will be visiting again. Do you do newsletters by email? I simply wished to appreciate you once more. I am not sure the things I would have undertaken in the absence of the type of points discussed by you on this area. It truly was a frightening scenario in my opinion, however , observing a new well-written manner you dealt with that made me to jump with delight. Now i am happier for this guidance and thus expect you are aware of a powerful job you are accomplishing educating the others all through your webpage. Probably you have never come across all of us. Hello my family member! I wish to say that this article is awesome, nice written and include almost all vital infos. I would like to look extra posts like this . I’m still learning from you, while I’m making my way to the top as well. I definitely enjoy reading everything that is posted on your blog.Keep the posts coming. I enjoyed it! Hiya, I am really glad I have found this info. Today bloggers publish just about gossip and net stuff and this is actually frustrating. A good web site with exciting content, that’s what I need. Thank you for making this site, and I will be visiting again. Do you do newsletters by email? Hiya, I am really glad I have found this info. Today bloggers publish just about gossip and net stuff and this is really irritating. A good blog with interesting content, that’s what I need. Thanks for making this web site, and I’ll be visiting again. Do you do newsletters by email? Hi there. I discovered your site by the use of Google even as looking for a comparable topic, your website came up. It seems good. I’ve bookmarked it in my google bookmarks to visit then. Hey there. I found your site by means of Google while looking for a related topic, your web site came up. It seems to be good. I have bookmarked it in my google bookmarks to visit then. Hi there! Someone in my Facebook group shared this site with us so I came to give it a look. I’m definitely enjoying the information. I’m book-marking and will be tweeting this to my followers! Outstanding blog and superb design and style. Hello there. I discovered your web site by means of Google at the same time as searching for a related matter, your website got here up. It appears good. I’ve bookmarked it in my google bookmarks to visit then. post was great. I don’t recognze who you’re however definitely you are going to a well-known bloggеr should you are not alreadʏ. Hiya, I’m really glad I’ve found this info. Nowadays bloggers publish only about gossip and web stuff and this is really irritating. A good website with interesting content, that’s what I need. Thanks for making this website, and I’ll be visiting again. Do you do newsletters by email? Hi! Quick question that’s entirely off topic. Do you know how to make your site mobile friendly? My web site looks weird when viewing from my iphone4. I’m trying to find a theme or plugin that might be able to resolve this problem. If you have any recommendations, please share. Thanks! Greetings! I know this is kinda off topic but I’d figured I’d ask. Would you be interested in exchanging links or maybe guest authoring a blog post or vice-versa? My blog discusses a lot of the same topics as yours and I feel we could greatly benefit from each other. If you happen to be interested feel free to shoot me an email. I look forward to hearing from you! Terrific blog by the way! I have to show my respect for your generosity in support of folks that actually need assistance with this particular issue. Your personal commitment to passing the message all around had become certainly invaluable and has regularly enabled somebody like me to reach their dreams. This useful information denotes this much a person like me and extremely more to my fellow workers. Many thanks; from all of us. I’m still learning from you, but I’m trying to achieve my goals. I absolutely liked reading all that is posted on your website.Keep the tips coming. I enjoyed it! Hiya, I am really glad I have found this info. Nowadays bloggers publish just about gossip and web stuff and this is actually frustrating. A good website with exciting content, that’s what I need. Thanks for making this site, and I’ll be visiting again. Do you do newsletters by email? Hiya, I am really glad I’ve found this information. Nowadays bloggers publish just about gossip and web stuff and this is really frustrating. A good website with exciting content, that is what I need. Thanks for making this website, and I will be visiting again. Do you do newsletters by email? Thanks for all of your effort on this web site. My mother delights in managing research and it’s obvious why. We all notice all concerning the lively form you offer practical thoughts via the website and in addition inspire response from others on this issue while our princess is certainly starting to learn a lot. Enjoy the rest of the new year. You are conducting a glorious job. Hiya, I’m really glad I have found this information. Today bloggers publish only about gossip and web stuff and this is actually annoying. A good blog with exciting content, that’s what I need. Thank you for making this website, and I will be visiting again. Do you do newsletters by email? Hi there. I discovered your blog by the use of Google at the same time as searching for a similar matter, your site came up. It seems great. I’ve bookmarked it in my google bookmarks to visit then. I’ve recently started a site, the info you offer on this web site has helped me greatly. Thanks for all of your time & work. “Men must be taught as if you taught them not, And things unknown proposed as things forgot.” by Alexander Pope. Hi there. I discovered your web site by means of Google even as looking for a comparable matter, your site came up. It appears to be great. I have bookmarked it in my google bookmarks to visit then. Appreciating the persistence you put into your site and detailed information you offer. It’s good to come across a blog every once in a while that isn’t the same out of date rehashed material. Wonderful read! I’ve saved your site and I’m adding your RSS feeds to my Google account. Awesome blog! Do you have any suggestions for aspiring writers? I’m hoping to start my own site soon but I’m a little lost on everything. Would you recommend starting with a free platform like WordPress or go for a paid option? There are so many choices out there that I’m totally confused .. Any suggestions? Kudos! Howdy, i read your blog occasionally and i own a similar one and i was just wondering if you get a lot of spam remarks? If so how do you reduce it, any plugin or anything you can advise? I get so much lately it’s driving me crazy so any help is very much appreciated. Please let me know if you’re looking for a writer for your weblog. You have some really good articles and I think I would be a good asset. If you ever want to take some of the load off, I’d really like to write some articles for your blog in exchange for a link back to mine. Please shoot me an email if interested. Thanks! I was reading some of your posts on this internet site and I think this website is really instructive! Continue putting up. First off I would like to say fantastic blog! I had a quick question which I’d like to ask if you don’t mind. I was interested to find out how you center yourself and clear your thoughts prior to writing. I’ve had a difficult time clearing my mind in getting my ideas out there. I truly do enjoy writing but it just seems like the first 10 to 15 minutes are usually lost simply just trying to figure out how to begin. Any suggestions or hints? Cheers! Thanks for your marvelous posting! I genuinely enjoyed reading it, you are a great author.I will be sure to bookmark your blog and will often come back in the future. I want to encourage you to ultimately continue your great posts, have a nice day! Hiya, I’m really glad I’ve found this info. Nowadays bloggers publish just about gossip and web stuff and this is actually irritating. A good site with exciting content, that’s what I need. Thanks for making this web site, and I will be visiting again. Do you do newsletters by email? Have you ever considered about adding a little bit more than just your articles? I mean, what you say is important and everything. However think of if you added some great images or video clips to give your posts more, “pop”! Your content is excellent but with images and videos, this website could definitely be one of the very best in its niche. Fantastic blog! Hiya, I’m really glad I have found this information. Today bloggers publish only about gossip and internet stuff and this is really frustrating. A good website with interesting content, that’s what I need. Thanks for making this website, and I will be visiting again. Do you do newsletters by email? Hey! Someone in my Facebook group shared this website with us so I came to check it out. I’m definitely loving the information. I’m bookmarking and will be tweeting this to my followers! Exceptional blog and wonderful design and style. whoah this weblog is fantastic i like reading your posts. Keep up the good work! You realize, a lot of people are searching around for this info, you can help them greatly. Hi I am so glad I found your web site, I really found you by accident, while I was searching on Bing for something else, Regardless I am here now and would just like to say kudos for a marvelous post and a all round enjoyable blog (I also love the theme/design), I don’t have time to read it all at the moment but I have saved it and also included your RSS feeds, so when I have time I will be back to read more, Please do keep up the fantastic job. Hey there. I found your web site by way of Google whilst looking for a similar matter, your website got here up. It appears good. I have bookmarked it in my google bookmarks to visit then. Hi there. I discovered your site by the use of Google even as looking for a related topic, your site got here up. It seems to be great. I’ve bookmarked it in my google bookmarks to visit then. Hi there. I found your blog by way of Google even as looking for a related subject, your website got here up. It seems great. I’ve bookmarked it in my google bookmarks to come back then. Simply desire to say your article is as surprising. The clarity in your post is just excellent and i could assume you’re an expert on this subject. Fine with your permission let me to grab your feed to keep updated with forthcoming post. Thanks a million and please continue the enjoyable work. Hello there. I found your site by the use of Google whilst searching for a related subject, your web site got here up. It seems to be great. I’ve bookmarked it in my google bookmarks to visit then. Hiya, I am really glad I’ve found this information. Today bloggers publish just about gossip and net stuff and this is really annoying. A good blog with interesting content, this is what I need. Thank you for making this site, and I will be visiting again. Do you do newsletters by email? Thank you, I have just been looking for info about this subject for a while and yours is the best I’ve came upon so far. But, what in regards to the bottom line? Are you positive concerning the source? Hey there. I found your website by the use of Google at the same time as looking for a related matter, your website got here up. It seems to be great. I’ve bookmarked it in my google bookmarks to come back then. Hiya, I am really glad I’ve found this info. Today bloggers publish only about gossip and web stuff and this is actually irritating. A good blog with interesting content, this is what I need. Thank you for making this web site, and I will be visiting again. Do you do newsletters by email? Hiya, I am really glad I have found this information. Nowadays bloggers publish only about gossip and net stuff and this is really irritating. A good site with exciting content, that’s what I need. Thanks for making this site, and I’ll be visiting again. Do you do newsletters by email? Hiya, I’m really glad I have found this information. Nowadays bloggers publish just about gossip and net stuff and this is really frustrating. A good web site with interesting content, that is what I need. Thanks for making this web site, and I’ll be visiting again. Do you do newsletters by email? Hiya, I’m really glad I have found this information. Nowadays bloggers publish just about gossip and internet stuff and this is actually annoying. A good web site with interesting content, that’s what I need. Thanks for making this website, and I will be visiting again. Do you do newsletters by email? Hiya, I’m really glad I have found this information. Today bloggers publish only about gossip and internet stuff and this is actually annoying. A good website with exciting content, that’s what I need. Thanks for making this site, and I will be visiting again. Do you do newsletters by email? Hi there. I discovered your site by means of Google even as searching for a similar topic, your web site got here up. It appears great. I’ve bookmarked it in my google bookmarks to visit then. and so far? I surprised with the analysis you made to make this actual put up extraordinary. Hi there. I found your blog via Google whilst looking for a similar matter, your web site came up. It appears to be good. I’ve bookmarked it in my google bookmarks to visit then. Hey there. I discovered your site via Google whilst searching for a similar topic, your website came up. It seems to be great. I have bookmarked it in my google bookmarks to come back then. Hiya, I’m really glad I have found this information. Today bloggers publish only about gossips and internet and this is actually annoying. A good website with exciting content, that’s what I need. Thanks for keeping this web site, I’ll be visiting it. Do you do newsletters? Can’t find it. Hello there. I found your site by way of Google at the same time as looking for a similar matter, your website came up. It seems great. I’ve bookmarked it in my google bookmarks to visit then. Hiya, I am really glad I’ve found this information. Nowadays bloggers publish just about gossip and internet stuff and this is actually irritating. A good website with exciting content, this is what I need. Thanks for making this web-site, and I will be visiting again. Do you do newsletters by email? Hiya, I’m really glad I have found this information. Nowadays bloggers publish just about gossip and web stuff and this is actually frustrating. A good site with interesting content, that’s what I need. Thank you for making this website, and I will be visiting again. Do you do newsletters by email? With havin so much content do you ever run into any problems of plagorism or copyright violation? My website has a lot of exclusive content I’ve either created myself or outsourced but it seems a lot of it is popping it up all over the internet without my agreement. Do you know any techniques to help prevent content from being ripped off? I’d certainly appreciate it. We stumbled over here coming from a different web page and thought I may as well check things out. I like what I see so now i am following you. Look forward to looking over your web page yet again. Hiya, I’m really glad I’ve found this information. Nowadays bloggers publish only about gossip and net stuff and this is actually annoying. A good blog with interesting content, that is what I need. Thanks for making this web-site, and I’ll be visiting again. Do you do newsletters by email? Hello there. I discovered your website by way of Google even as looking for a related matter, your site got here up. It looks great. I’ve bookmarked it in my google bookmarks to visit then. Hiya, I am really glad I’ve found this info. Today bloggers publish only about gossip and web stuff and this is really irritating. A good website with interesting content, that is what I need. Thanks for making this website, and I’ll be visiting again. Do you do newsletters by email? Hiya, I’m really glad I’ve found this info. Today bloggers publish just about gossip and internet stuff and this is actually irritating. A good site with interesting content, that is what I need. Thank you for making this website, and I’ll be visiting again. Do you do newsletters by email? Hello there. I found your site by the use of Google at the same time as looking for a related subject, your site got here up. It seems great. I’ve bookmarked it in my google bookmarks to come back then. Hello there. I discovered your web site by way of Google while searching for a similar matter, your site got here up. It appears to be great. I’ve bookmarked it in my google bookmarks to come back then. Hiya, I’m really glad I’ve found this information. Nowadays bloggers publish only about gossip and internet stuff and this is really frustrating. A good site with interesting content, that is what I need. Thanks for making this web site, and I will be visiting again. Do you do newsletters by email? Hey there. I found your web site by way of Google at the same time as looking for a comparable subject, your site came up. It appears to be great. I’ve bookmarked it in my google bookmarks to visit then. Hiya, I am really glad I have found this info. Nowadays bloggers publish only about gossip and net stuff and this is really irritating. A good blog with interesting content, that’s what I need. Thanks for making this web site, and I will be visiting again. Do you do newsletters by email? Hello there. I discovered your website by means of Google at the same time as searching for a comparable topic, your web site came up. It appears great. I’ve bookmarked it in my google bookmarks to come back then. Hiya, I’m really glad I’ve found this information. Today bloggers publish only about gossip and web stuff and this is really annoying. A good web site with interesting content, that is what I need. Thank you for making this web site, and I’ll be visiting again. Do you do newsletters by email? Somebody necessarily help to make seriously posts I’d state. This is the very first time I frequented your web page and up to now? I amazed with the analysis you made to create this particular submit amazing. Sbobet task! Hi there. I discovered your website by the use of Google even as searching for a related subject, your web site got here up. It seems great. I’ve bookmarked it in my google bookmarks to visit then. Normally I do not learn article on blogs, but I wish to say that this write-up very pressured me to try and do so! Your writing style has been amazed me. Thanks, very nice post. You could certainly see your expertise within the work you write. The arena hopes for more passionate writers such as you who are not afraid to say how they believe. Always go after your heart. Hiya, I am really glad I have found this info. Nowadays bloggers publish just about gossip and internet stuff and this is actually irritating. A good site with exciting content, this is what I need. Thank you for making this site, and I will be visiting again. Do you do newsletters by email? Have you ever considered about including a little bit more than just your articles? I mean, what you say is valuable and all. Nevertheless just imagine if you added some great graphics or videos to give your posts more, “pop”! Your content is excellent but with images and videos, this website could definitely be one of the most beneficial in its field. Very good blog! Hi there. I found your site by the use of Google while looking for a comparable matter, your web site came up. It appears great. I’ve bookmarked it in my google bookmarks to come back then. Hi there. I found your web site by the use of Google while looking for a comparable subject, your web site came up. It appears good. I have bookmarked it in my google bookmarks to visit then. I do accept as true with all the ideas you have introduced in your post. They are really convincing and can certainly work. Still, the posts are too brief for beginners. May just you please lengthen them a little from subsequent time? Thanks for the post. Hey there. I discovered your website by way of Google even as searching for a related matter, your site came up. It seems to be good. I have bookmarked it in my google bookmarks to visit then. Hiya, I am really glad I’ve found this info. Today bloggers publish only about gossip and web stuff and this is really annoying. A good website with exciting content, that’s what I need. Thanks for making this website, and I will be visiting again. Do you do newsletters by email? Hello there. I discovered your web site by way of Google at the same time as searching for a comparable topic, your web site got here up. It appears great. I’ve bookmarked it in my google bookmarks to visit then. Hiya, I’m really glad I have found this info. Nowadays bloggers publish just about gossip and internet stuff and this is really annoying. A good blog with exciting content, that’s what I need. Thanks for making this web-site, and I will be visiting again. Do you do newsletters by email? I’m really loving the theme/design of your site. Do you ever run into any web browser compatibility issues? A handful of my blog readers have complained about my website not operating correctly in Explorer but looks great in Opera. Do you have any ideas to help fix this issue? You really make it appear really easy with your presentation however I in finding this topic to be really one thing that I think I’d by no means understand. It seems too complex and very vast for me. I am taking a look ahead in your subsequent post, I will try to get the hold of it! Hey there. I discovered your web site via Google whilst looking for a related matter, your website came up. It appears great. I have bookmarked it in my google bookmarks to come back then. Hiya, I am really glad I’ve found this information. Nowadays bloggers publish only about gossip and internet stuff and this is really frustrating. A good site with interesting content, that is what I need. Thanks for making this website, and I will be visiting again. Do you do newsletters by email? Hiya, I’m really glad I’ve found this info. Today bloggers publish just about gossip and net stuff and this is really irritating. A good site with exciting content, that is what I need. Thank you for making this website, and I’ll be visiting again. Do you do newsletters by email? Hey there. I discovered your web site by means of Google at the same time as looking for a related matter, your site got here up. It looks great. I’ve bookmarked it in my google bookmarks to come back then. Hiya, I’m really glad I have found this info. Today bloggers publish only about gossip and net stuff and this is actually annoying. A good blog with interesting content, that is what I need. Thanks for making this site, and I’ll be visiting again. Do you do newsletters by email? Hello there. I discovered your web site by means of Google while looking for a comparable matter, your web site got here up. It appears good. I’ve bookmarked it in my google bookmarks to come back then. Thank you so much for being the coach for this topic. I really liked this content very much and most of all I liked reading how you dealt with the issues I thought to be marked by controversy. You are always fairly kind to viewers really like me and assist me with my living. Thank you very much. Hello there. I discovered your website by means of Google at the same time as searching for a comparable subject, your site got here up. It appears to be good. I have bookmarked it in my google bookmarks to come back then. Hey there. I found your blog via Google whilst looking for a similar topic, your web site got here up. It seems to be good. I’ve bookmarked it in my google bookmarks to visit then. You completed some good points there. I did a search on the theme and found a good number of people will consent with your blog. I absolutely love your blog and find most of your post’s to be just what I’m looking for. Do you offer guest writers to write content for you personally? I wouldn’t mind publishing a post or elaborating on a number of the subjects you write regarding here. Again, awesome site! Hey there. I found your website by the use of Google at the same time as looking for a comparable subject, your web site came up. It appears good. I’ve bookmarked it in my google bookmarks to visit then.